This shows plans for the Outdoor Early Literacy Area planned for the Redwood Falls Public Library. 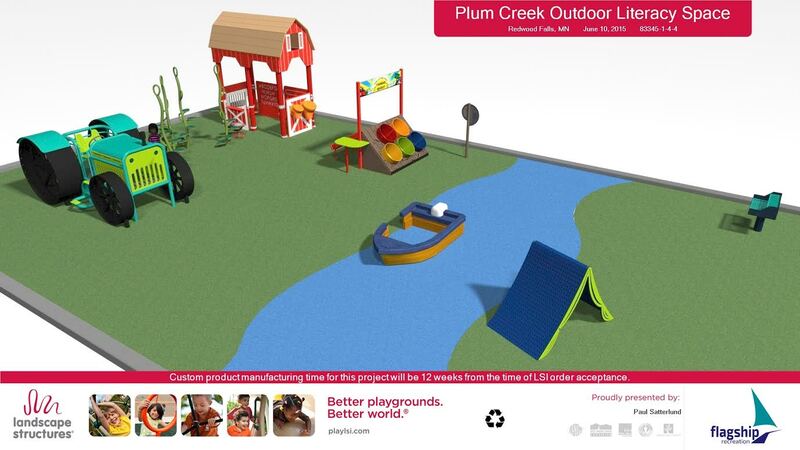 The playground equipment will be custom made and themed to agriculture and camping. Image courtesy of the Redwood Falls Public Library. IN MY HOME COUNTY OF REDWOOD on the southwestern Minnesota prairie, the Redwood Falls Public Library is planning to construct an Outdoor Early Literacy Area themed to agriculture and camping. 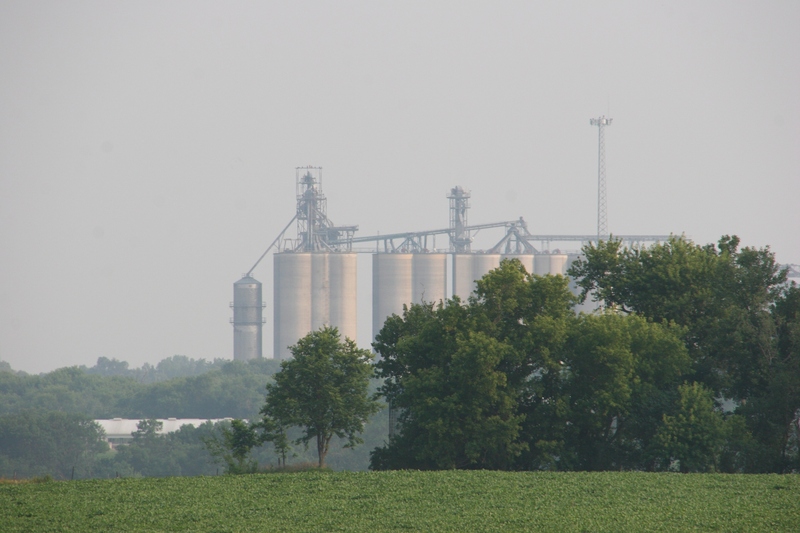 A soybean field and the grain elevator in Lamberton, Minnesota, in southern Redwood County. Minnesota Prairie Roots file photo July 2015. I love this idea of combining literacy and outdoor play. And the themes are perfect for this community. Even though kids in Redwood County live in the heart of Minnesota farm country, that doesn’t mean they are familiar with farming. This is just one more way to keep Minnesota’s farm heritage strong, by teaching youngsters the importance of agriculture in a way that’s hands-on creative. Ramsey Falls in Alexander Ramsey Park. Minnesota Prairie Roots file photo. 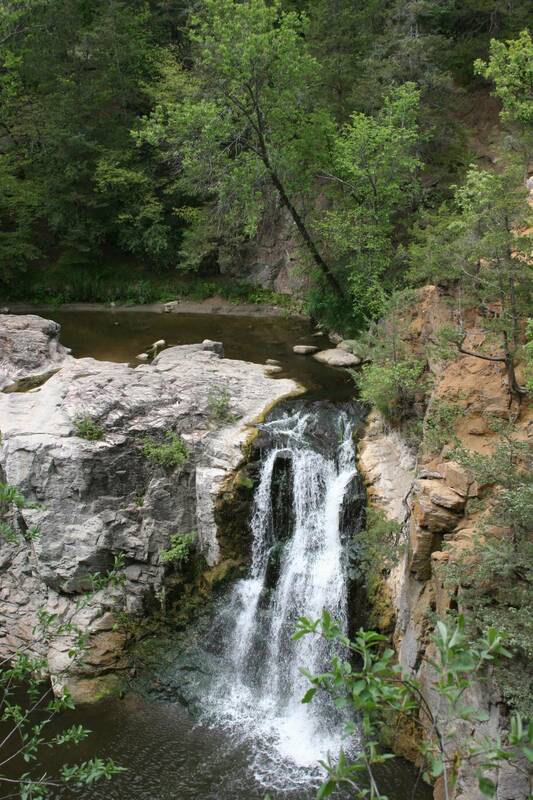 Redwood Falls is also a camping oasis of sorts with Alexander Ramsey Park, known as the “Little Yellowstone of Minnesota.” The park is a surprise of woods, hills, river valley and waterfalls in this county of small towns and cropland. The camping aspect will instill an appreciation of the outdoors and recreation in this place of prairie and sky. Encourage a love of literacy in a developmentally appropriate environment. Incorporate a love of reading, print awareness, letter knowledge, sound awareness, vocabulary, and narrative skills and comprehension in joyful play. Cultivate literacy in a relevant way (using known objects and activities relevant to southwestern Minnesota). Encourage families and young children to spend more time at the library. Encourage a love of learning at an early age and throughout a lifetime. Just another view of the planned literacy area. Image courtesy of the Redwood Falls Public Library. So how, exactly, will that happen? Young families can check out pretend produce, eggs, fishing equipment and even numbered and lettered fish from the library to use outdoors. And, as they play, the kids will learn about healthy living and agriculture and acquire literacy skills. The children’s librarian will model play and interactions in the outdoor space, Smith says. The library also hopes to tap into Reading Corps volunteers. A place like this is needed, says Smith, because few areas exist in this rural community for young families to gather and enjoy one another’s company while learning valuable literacy and social skills. Already, the library has raised some two-thirds of the $100,000 needed for the outdoor literacy area. An astounding nearly $51,000 has come in the form of 12 grants (one is a materials donation of fencing) ranging from $250 – $20,000, all sought by Smith. The largest of the grants came from the Otto Bremer Foundation. Two $10,000 grants also were awarded by the Schmidt Foundation and the Minnesota Legacy fund. Smith is awaiting word on several other grants and donations. 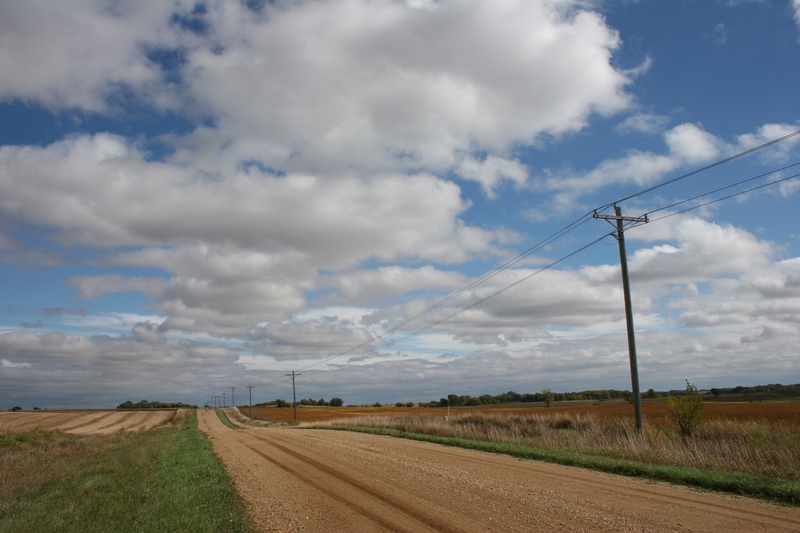 A serene country scene just north of Lamberton in southern Redwood County. Minnesota Prairie Roots file photo October 2013. And, as I would expect in a rural area, local individuals, organizations and businesses have also given their generous financial support to the project. Smith has also established an online fundraising site at YouCaring. About a month remains to meet that $10,000 fundraising goal. 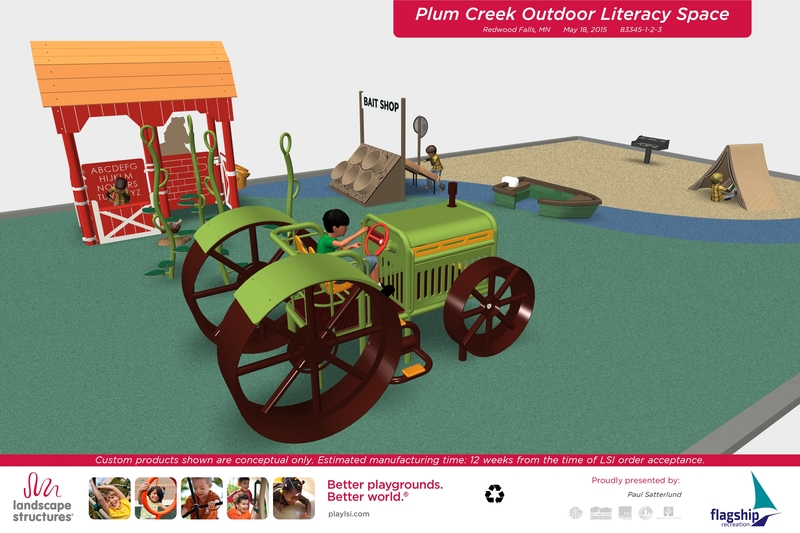 The popularity of a Minnesota Children’s Museum traveling Storyland exhibit which came to Redwood Falls inspired library staff to consider a permanent outdoor literacy-based play space. If all goes as planned, the custom-designed farming and camping themed play area should be under construction in the spring of 2016. FYI: If you missed my post yesterday on Sibley Farm inside Mankato’s Sibley Park, click here. It’s another great example of how southern Minnesota is connecting kids to the region’s strong agricultural heritage and base. Wow! What a great idea!!! I’ve not been to that town (or traveled much in that area!) but imagine that the children of today are growing up without having the FFA/4H involvement of years ago. It’s been years since our local schools dropped those groups, along with shop, for budgetary reasons and are, now, thinking of adding some back. It seems that, until there has been a lengthy gap in availability of such programs, their value is not seen/appreciated. You have been close to Redwood Falls, though, having traveled Highway 14. Alexander Ramsey Park is worth a visit. It’s so unexpected in the middle of the prairie. FFA and 4-H are still quite active in Redwood County, I think. My niece even served as the Minnesota State FFA president while attending Wabasso High School, which is in Redwood County. Even with these groups still active, it does not mean kids are involved or are connected much to agriculture. I see that resurgence, too, in some programs that were cut. Combining literacy and outdoor play is a wonderful idea. Get those kid away from a TV/video games and outside. At some point, recruiting stewards of our natural wonders and nature in general may become an issue; hopefully not due to programs like this. I’ve only briefly visited this park, but what I have seen it was very nice. What a great candidate for this project/. I am looking forward to a return trip this fall. Great to hear you’ve been to Alexander Ramsey Park. It’s beautiful and so unexpected in this region. I agree. Get the kids outdoors. My mom is a retired teacher and I cannot tell you how many hours she spent cutting out felt people and things to create story boards for children. She was a big promoter of interactive play to learn. My grandma was a pioneer in the State of Minnesota in helping start Head Start in the rural community she lived in. Her daughter and grandson were experiencing learning delays and thought learning early would give them a great start later on. My other grandmother spent a lot of time with me and my brother educating us when we were not in traditional school. All these women helped me learn to read and come to love reading, using my imagination and writing. What a wonderful family you had/have to focus on learning. No wonder you are as introspective and creative as you are. Kudos to your mom and grandma! The greatest lesson I learned growing up is not to tell mom or grandma that you were bored since they would put you to work. So I escaped to the great outdoors or within books growing up to be curious and creative, explore and adventure and use my imagination to make believe and pretend. Yes I was, especially when they handed you a used toothbrush to clean with – RUN!!! I can just see your legs flying. I think so, too, and I expect kids and their parents will love this play area. Ah, Kim, thank you. You just made my day. I don’t believe I’ve ever been called a gem. That sounds like a lot of fun and a perfect way to make reading fun! This is an interesting concept. Libraries have certainly changed since I was a kid. I’ll have to share this story with our daughter. I didn’t even have a library to go to when I was a kid. Yes, libraries, like everything, must change with the times. I think this idea is truly exceptional. Yes, your daughter the librarian should enjoy learning about this concept.